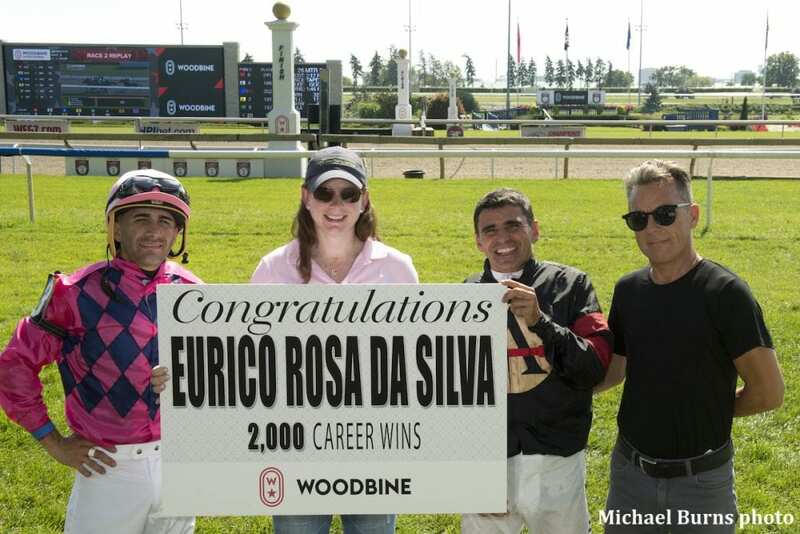 Eurico Rosa Da Silva, Woodbine's leading jockey for the past four seasons, reached the 2,000th career win mark in North America with his first mount on the Friday afternoon program. Da Silva earned the milestone victory in the second race aboard favorite Intanga Rose, who won the allowance optional claiming race for 2-year-old fillies over six furlongs on the main track in 1:11.48. The Stronach Stables' homebred Animal Kingdom filly is now undefeated in two starts at Woodbine. She is trained by Hall of Famer Sid Attard, who also recently celebrated his own 2,000th career win in late-July. Sent postward as the 2-5 favourite, Intanga Rose and Da Silva trailed the five-horse field early on then charged up wide on the outside down the backside before running on past the front-striding Si Si Tequila in the stretch to score by more than two lengths. Intanga Rosa returned $2.80 to win. “Before the race I was very nervous,” said Da Silva. “I told Rafael [Hernandez] my stomach was very nervous, tingling. I wanted to get the 2,000 so badly. Da Silva, who noted his appreciation for all the trainers and owners that offered him a leg up through the years, struggled to identify just one special horse among the 2,000 winners. A 43-year-old Sao Paulo, Brazil, native, Da Silva came to Woodbine in 2004 and has enjoyed tremendous success since. He was a part of Horse of the Year campaigns by Pink Lloyd (2017), Up With the Birds (2013), Biofuel (2010) and Fatal Bullet (2008), and himself was named Canada's outstanding jockey five times. This entry was posted in NL List, People and tagged eurico rosa da silva, Horse Racing, Intanga Rose, jockey milestones, pink lloyd, Stronach Stables, woodbine by Press Release. Bookmark the permalink.